This site provides GPS users with downloadable custom maps containing Minnesota Department of Natural Resources (MNDNR) Wildlife Management Area boundary and parking area data. The MNDNR does not endorse one specific company, hardware product, or software product over another. The MNDNR does not offer support for GPS hardware or software. The MNDNR is not affiliated with any manufacturers mentioned within these web pages or their downloadable installation software. All brand names and product names are trademarks of the respective manufacturers. All map data contained in this file representing State Wildlife Management Area (WMA) boundaries and Parking Areas are general and at this scale DO NOT accurately represent the actual legal boundaries or legal access to these areas, and thus should be used for reference only. All map data contained in the GPS files are subject to change. Typically, the GPS files will be updated once a year. 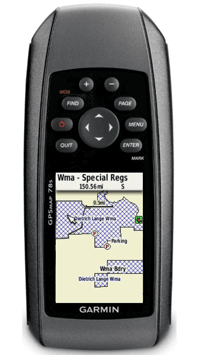 The user of this GPS data needs to verify public land boundaries by observing boundary signs and contacting local DNR Wildlife offices for the actual location of WMA boundaries. At this time we are providing Garmin background maps in the IMG format. This file format depicts State Wildlife Management Area boundaries and parking areas. We cannot guarantee that our IMG file(s) will work with any or all Garmin units. Check your Garmin GPS documentation to see if your GPS supports the corresponding file types. Support for any other file formats is not available at this time.